Itâ€™s often said that when money is tight, maintenance is the first thing to go. When you own a home, skimping on maintenance in any way can lead to bigger â€“ and much more expensive â€“ problems later. Home maintenance truly comes within the old saying, an ounce of prevention is worth a pound of cure. What maintenance tasks can you take on that will save you big money later? 1. Caulk windows, doors and siding regularly. Cracks in the seals around windows and doors, or in the joints of wood siding, can open your home to water damage and pest infestations. If the cracks are left untreated too long you can incur many thousands of dollars in repair costs. If it gets bad enough â€“ for example, severe rot overtaking wall studs and support beams â€“ you could be looking at tens of thousands of dollars worth of repairs. Since the damage will have been caused by neglect, rather than by a natural event, your homeowners insurance will not cover repair or replacement. The positive side of this is that caulking is one of the least expensive maintenance jobs you can perform on your home. For a few dollars you can purchase a caulking gun and caulk refills and do the job yourself. Caulk any obvious cracks anywhere on the exterior of the home, and also remove and replace any deteriorating joints. You should inspect your home for cracks at least every year, and plan on caulking at least every two years, or sooner if needed. 2. Paint the exterior every few years. Though we normally think of painting as being primarily a cosmetic function, it is another way to save money by preventing bigger damage later. If painted surfaces are not repainted frequently enough, the underlying wood could become cracked or porous, or even begin to rot. This could be another source of water damage or pest infestation. Depending on where you live, you may need to repaint your home exterior every 5 to 10 years. Hot or wet climates (including areas with high levels of humidity) generally require more frequent repainting. Doing so regularly can prevent the need to replace siding and wood trim, often at a cost of many thousands of dollars. 3. Redirect water away from the house. Water is a constant threat to a home, and not just to the upper structure of the house either. Water damage to the foundation or basement can cause even more expensive problems later. In addition to performing regular maintenance on your roof and on the basic structure of the home, you should also do whatâ€™s necessary to direct water flows away from the foundation of the building. Water pooling anywhere outside the foundation can eventually begin to degrade even concrete walls, causing serious water damage on the inside of the home. Be sure to fill in any low spots in the soil adjacent to the foundation where water may be pooling. Consider extending your downspouts so that they drain at least 6 feet away from the house. This will prevent water from flowing back toward the foundation. Also, clean your gutters and downspouts at least twice each year; clogged gutters and down spouts can cause all the water damage problems that you are trying to prevent. 4. 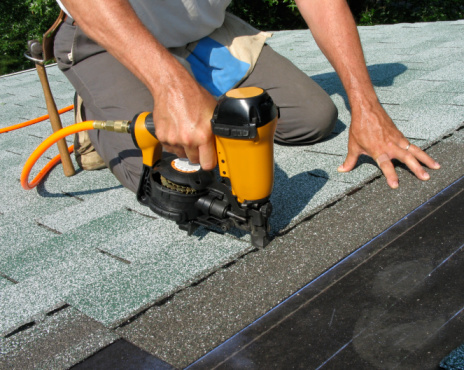 Take care of little roof leaks before they become bigger ones. Where a roof is concerned, big leaks usually start with very small ones. In order to extend the life of your roof, you should work immediately to fix any leaks in the roof, regardless of how small they may be. An uncorrected leak in a roof can cause substantial damage to both drywall and even to the basic wood structures. If the problem becomes this advanced, not only will you be replacing the roof, but you could also be spending thousands of dollars to repair the interior the home. Another important point to consider with leaks is that more significant structural damage may not be apparent for several years. For example, the drywall in the ceiling under the roof leak could become waterlogged and one day collapse. If it does â€“ and it will most likely happen during heavy rains â€“ you will not only have structural damage to correct, but you may also have significant damage to furniture and flooring. Fix those little leaks quickly, and avoid them becoming something more significant. 5. Maintain your termite bond. A pest inspector once told me that there are two kinds of bugs â€“ the ones that are simply annoying, and the ones that do structural damage. Most people, however, are more likely to react to annoying bugs than to the ones that do real damage. This would include termites and carpenter ants, and one of the biggest problems here is that you are usually unaware that they are in your home until it is too late. Insects that bore into wood can do damage similar to what flooding can do. They can spend years eating away at the wood structure of your home until some external event reveals the damage. But by then you could be looking at many thousands of dollars in repair work. Make sure that you have a termite bond, and that you keep it active. This will usually require regular inspections by a termite company, and that will be well worth the money spent for it. Spend a few hundred dollars each year to prevent tens of thousands of dollars worth of damage in the future. Are there other preventative maintenance projects for the home that cost little but can save a fortune later? Leave a comment! All very good and valid tips – As always it is important to do the preventative maintenance, a simple clean up around the house can do wonders. Many first time home owners fail to realize the tips you have offered. Thanks for sharing! Excellent idea, periodic visual inspections. Any opening in the house can be a point of entry for water, cold/hot air, insects or small animals. They can be closed and sealed with very litte effort or expense, and save you thousands of dollars later. All good points. It’s also a good idea to do a visual inspection a couple times a year. A lot can happen to the house during a cold winter or hot summer. And not just big things. But peeling paint on trim that can rot, critter holes, bees nests, broken stuff. Most of these can easily be fixed without any experience or a lot of money.